Eduard Gustav Freiherr von Toll (14 March [O.S. 2 March] 1858 – 1902), often referred to as Baron von Toll, was a Baltic German geologist and Arctic explorer. He was most notable for the leading Russian polar expedition of 1900–1902 of the legendary Sannikov Land. He was known as Eduárd Vasílʹevich Tollʹ in Russia (Russian: Эдуа́рд Васи́льевич Толль). Eduard von Toll was born on 14 March [O.S. 2 March] 1858, in Reval of the Governorate of Estonia (now Tallinn, Estonia). He belonged to the Baltic German noble Toll family and was married to Emmeline "Emmy" Magdalene von Wilcken [et]. He was a close relative of the Middendorff family, and one of the Toll's teachers was the academician of the Imperial Academy of Sciences Alexander von Middendorff. Toll graduated from the Imperial University of Dorpat (Tartu) as a zoologist in 1882. Already while he was a student he traveled to the Mediterranean and researched the fauna, flora and geology of Algeria and the Balearic Islands. Baron von Toll with his signature in German below him. In 1885-1886 Toll took part in an expedition to the New Siberian Islands, organized by the St. Petersburg Academy of Sciences and led by Alexander Bunge. Eduard Toll explored the Great Lyakhovsky Island, Bunge Land, Faddeyevsky Island, Kotelny Island, as well as the western shores of the New Siberia Island. In 1886 Toll thought that he had seen an unknown land north of Kotelny. He guessed that this was the so-called "Zemlya Sannikova" (Sannikov Land), a land that Yakov Sannikov and Matvei Gedenschtrom claimed to have seen during their 1808-1810 expedition, but whose existence had never been proved. Eduard Toll was among the first to report in detail about the abundance of Pleistocene fossils found within Bolshoy Lyakhovsky Island, one of the New Siberian Islands. Under a peat composed of water mosses covering what he described as "perpetual ice", now known to be permafrost, Baron von Toll found fragments of willow and the bones of post-Neogene mammals, like the shoulder-bone of a saber-toothed tiger. He also reported having found in a frozen, sandy clay layer and lying on its side, a complete tree of Alnus fruticosa 15 to 20 ft (4.5 to 6 m) in length, including roots, with leaves and cones adhering. Unfortunately, his reports have been frequently either misrepresented or badly garbled by popular accounts of his findings, stating it to be a plum tree of a different size. The Academy appreciated the results of this expedition as "a true geographical deed". 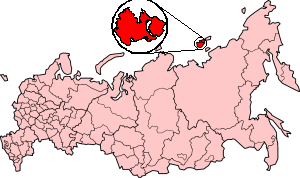 In 1893 Toll led an expedition of the Petersburg Academy of Sciences to the northern parts of Yakutia and explored the region between the lower reaches of the Lena and Khatanga Rivers. Eduard Toll became the first to map the plateau between the Anabar and Popigay Rivers and a mountain ridge between the Olenek and Anabar Rivers (which he named after Vasily Pronchischev). He also carried out geological surveys in the basins of the following rivers: Yana, Indigirka, and Kolyma. During one year and two days the expedition covered 25,000 km, of which 4,200 km were up the rivers, carrying out geodesic surveys en route. Owing to the difficulties of the expedition and his hard work, the Russian Academy of Sciences awarded Eduard v. Toll with the N.M. Przhevalsky Large Silver Medal. In 1899 Toll took part in a voyage of the icebreaker Yermak under the command of Stepan Makarov to the shores of Spitsbergen. In 1900-1902, Eduard Toll headed an expedition of the Petersburg Academy of Sciences to the New Siberian Islands, the Russian Polar Expedition, on the ship Zarya (Заря). The expedition primarily aimed to find the legendary Sannikov Land. During this voyage and especially during the winterings near the northwestern part of the Taymyr Peninsula and the western part of the Kotelny Island, Eduard Toll conducted extensive hydrographical, geographical, and geological research. Due to severe ice conditions the expedition had to spend two winters in the region of the bleak New Siberian Archipelago. In the end, Eduard von Toll traveled to Bennett Island by sledge and kayak along with three expedition members. The ship "Zarya" attempted to reach Bennett Island to evacuate Toll's party but was unable to do so because of severe ice conditions. Apparently, Toll made a decision to go south to the continent; no further traces of the four men have ever been found. Two search parties set out in the spring of 1903. One of them, under engineer Mikhail Brusnev, searched the shores of the New Siberian Islands; the other, under naval commander Aleksandr Kolchak traveled by whaleboat to Bennett Island. They did not find the lost explorers but they found the diaries and the collections of the Zarya expedition, which shed light on the tragic fate of Baron Eduard von Toll and of his companions. The name of Eduard von Toll remained on the geographical maps Fridtjof Nansen published. He named the Toll Bay on the north-west coast of the Taymyr Peninsula in honour of Eduard von Toll. 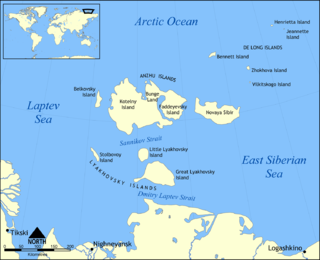 There is also the Tollievaya River, a cape on the Tsirkul Island in the Minina Skerries, mountains in Novaya Zemlya, the northernmost cape at Stolbovoy Island, the strait and a plateau at Kotelny Island and the central ice cap at Bennett Island. In certain fields, like paleontology, zoology and botany many specimens of fauna and flora are named after Baron Eduard von Toll, like for example the foraminiferan named Dendrophyra tolli (Awerinzew, 1911). Baron Toll was an expert in Siberian palaeontology. The following statement of Russian Academician V. A. Obruchev is well-known: "In all our guides on physical geography you can encounter the name of Eduard v. Toll as the founder of the doctrine of fossilized ice formation' – the doctrine which became a classic one". The Arctic icebreaking LNG tanker MV Eduard Toll is named after him. Wikimedia Commons has media related to Eduard Toll. ^ Carl Arvid von Klingspor (1882). Baltisches Wappenbuch. Stockholm. p. 178. ISBN 978-0-543-98710-5. Retrieved 18 April 2019. ^ von Toll, Baron E., 1895, Wissenschaftliche Resultate der Von der Kaiserlichen Akademie der Wissenschaften sur Erforschung des Janalandes und der Neusibirischen Inseln in den Jahren 1885 und 1886 Ausgesandten expedition. [Scientific Results of the Imperial Academy of Sciences of the Investigation of Janaland and the New Siberian Islands from the Expeditions Launched in 1885 and 1886] Abtheilung III: Die fossilen Eislager und ihre Beziehungen su den Mammuthleichen. Memoires de L'Academie imperials des Sciences de St. Petersbouro, VII Serie, Tome XLII, No. 13, Commissionnaires de I'Academie Imperiale des sciences, St. Peterabourg, Russia. ^ a b c "The Treasure of Eduard Toll - Eduard von Toll". www.shparo.com. Retrieved 7 January 2019. ^ "Vessel details for: EDUARD TOLL (LNG Tanker) - IMO 9750696, MMSI 311000548, Call Sign C6CR2 Registered in Bahamas | AIS Marine Traffic". MarineTraffic.com. Retrieved 2019-01-05. The Tillo Islands is a group of small islands covered with tundra vegetation. They stretch along the Kara Sea coastal region, right off the bleak coast of Siberia's Taymyr Peninsula. Most of the islands of the group are a mere 3 or 4 km from the continental shore.